Patterns are optimal solutions to common problems. As common problems are tossed around a community and are resolved, common solutions often spontaneously emerge. Eventually, the best of these rise above the din and self-identify (whoa..) and become refined until they reach the status of a Design Pattern. Design Patterns have a great cloud of evocative idioms swirling around them â€” “lifecycle”, for instance. It’s an evocative, suggestive, word with great tangible connotations. It seems promising to consider because physical things also have lifecycles. Unfortunately, those lifecycles often run from design to rubbish heap, and we need more well-designed Things, not more rubbish heaps. It’s right there in the title. 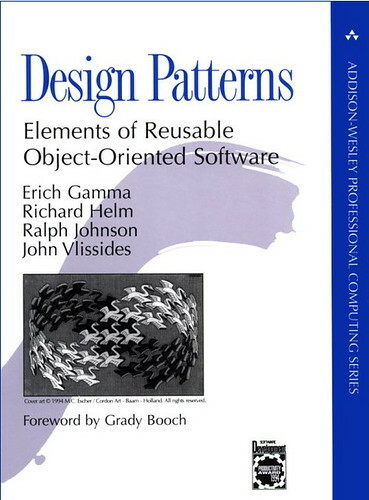 This should be required reading for all near-future Spime dudes and doodlers and tinkerers and thinkers: Design Patterns: Elements of Reusable Object-Oriented Software. Did you hear that? Reusable Objects. Software recycles. Awesome. These are from software but they’re so tangible and weighty and Thing-y. These should be able to translate to other practices, and jump disciplinary boundaries. Most practices have Design Patterns â— I might even argue that all do, but I’m against totalizing assertions most of the time. Think about a social practice. Web design, fashion design, aircraft design, barbequing, knitting, photography. They’ve all go their patterns — their approaches, stylings, “professionalized” ways of doing things. It’s a good thing that this Design Pattern thing exists. Just imagine a world in which there were no Design Patterns, which is like imagining a world in which there were no technical languages for specific practice idioms. The world just wouldn’t work right. 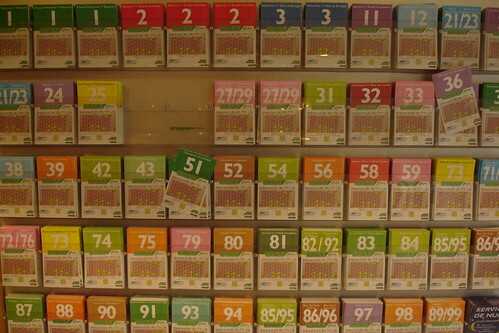 The “Theory Object” is a kind of design pattern for design itself. It’s about thinking by creating, and revealing the trail of discovery in the process of making things. And it has this recursive characteristic — not just revealing the process in the documentation or the manual or the “write-up” or the “post-mortem”, but actually embedding all of this within the designed Thing itself. This is what software engineers call “reflection” or “discovery” or “introspection” — a style of design patterns in which the software can tell you about itself while it’s running. This is great stuff for Internet of Things things, like Blogjects and Spimes. Why? Because we need to know about them while they’re doing their Thing. We want them to tell us where they came from, or how they operate or how to use them without digging up a manual. They should be “discoverable”, we should be able to “introspect” them and have them “reflect” their ontological aura to the rest of the room. Things, networked physical objects, should be able to do this as a matter of course. The JavaBeans API provides a framework for definining reusable (there’s our friend), embeddable, module software components. It’s a great concept, this introspection, reflection, discovery and these “Beans” â€” and one of the great instances of a legible vocabulary to describe the pattern. Reflection. Discovery. Introspection. Awesome. Makes me pround to be part-engineer, this one. But, of course, JavaBeans, reflection and discovery are the patterns that work really really well in software design practices. They make a lot of difficult problems easier, they create a standard approach that faciliates reuse. They provide approaches to things like open-source software design. How? By providing ways to comprehend how a bit of code works — either through patterns (“oh — i get it. this guy used the visitor pattern. right. i can now extend this functionality because i know how this one sub-component works. it’s legible to me because i know the pattern”), or through the more voodoo-like discovery, reflection and introspection. The Theory Object is a way of making things — of doing design — that reveals the process of design, all of Latour’s inscriptions, all the iterations all the trials and failures and wrong turns. Why? To make things public in this way reveals the “made”, “hand-crafted” social character of things. And it’s better, politically and for better futures, to know that something was made this way rather than that way, why such decisions are made, and by whom. By explicating the design process we see how making things, particularly science and technology things, is a social activity. And when we see science and technology activities as a social endeavor it is easier to have conversations about making one thing rather than another. And because science and technology play such an integral, crucial role in us imagining what the future can be, it is empowering to know that Things don’t have to be the way they are. Things can be different — both the material instantiation of some idea some researcher “gets” and the future that those material Things make possible. That’s empowering. Knowing that lots of decisions are made and knowing why they’re made and opening up the design process, particularly for science and technology Things. Knowing that Things can be different can empower us to imagine a future we want, rather than the one that Dow Chemical or DARPA wants for us. Here, finally, is the Theory Object recursion I was talking about: the Theory Object is the design pattern and the instantiation. It is a way to design — a pattern — and the outcome of adhering to that design pattern. This point is brought to bear in some neat things that near-future objects will be able to do, many of which Bruce Sterling is well-positioned to consider. These near-future Things will be able to tell us and other cohabitants in the Internet of Things about themselves â€” that will make them better neighbors and participants in the Internet of Things. They’ll just be well-behaved and coherent — it’s simple. Bruce Sterling’s right — widgets and gizmos are out. Some form of self-descriptive, introspective, reflective, Spimey Things are in. In the Internet of Things, Things that can’t tell us about them will be like junk DNA — no apparent use, probably a relic. Just hanging around for the ride. Detritus from a past evolutionary swerve. it’ll be like finding a Campbell’s soup can from an era before they had those nutritional labels and wondering — what’s in this thing? The Theory Object is supposed to reveal the process of design — capturing all the little bits and pieces, all of the inscriptions that brought the thing into being, all of its “DNA”, the parts manifests, CAD drawings, functional APIs. The Theory Object also reveals the design itself in its instantiation. So, my camera, say, can not only take pictures, but it can tell other cameras what it has taken pictures of and share those pictures by exchanging flickr! 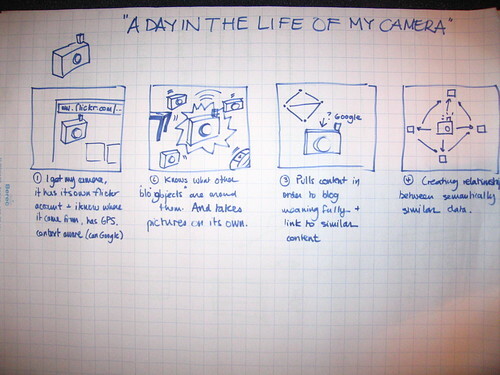 usernames — that’s right, cameras, not just humans, will have flickr! accounts. If there’s a next time, I’ll try to muddle through why this Theory Object —design pattern stuff is really, really important, why Things that work with this pattern matter. It’s real. It’s important. I’m not meshuggener.